“As new advancements in HPC and AI continue to push computational boundaries, data center operators are realizing liquid cooling is, in many cases, the only answer." CoolIT Systems (CoolIT), the global leader in energy efficient liquid cooling solutions, returns to the highly-anticipated ISC High Performance (ISC18) in Frankfurt, Germany, from June 25-27 with its latest Rack DCLC™ innovations for HPC, Cloud and AI data centers and servers. As the leading liquid cooling integration partner for OEM server manufacturers, CoolIT will showcase liquid-enabled servers from Intel, Dell EMC and HPE. 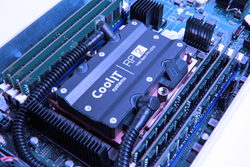 Combined with the broadest range of Coolant Distribution Units, CoolIT and their OEM partners are delivering the most complete and robust liquid cooling solutions to the HPC market. Intel Buchanan Pass – CoolIT is pleased to announce a liquid cooling solution compatible with the Intel Buchanan Pass server, capable of 86% heat capture with coldplates for the dual processors, voltage regulators, and memory. Dell EMC PowerEdge C6420 this liquid-enabled server will be on display at the Dell EMC booth (C-1210) and CoolIT booth (F-940). With factory-installed liquid cooling, this server pairs with CoolIT’s stainless steel Rack Manifolds and Coolant Distributions Units specifically for high performance and hyperscale workloads. HPE Apollo 2000 System – optimized with Rack DCLC to significantly enhance overall data center performance and efficiency. HPE Apollo Trade and Match Server Solution– optimized with Closed-Loop DCLC to increase density, decrease TCO and take advantage of enhanced performance to capitalize on High Frequency Trading trends. STULZ Micro Data Center, which combines CoolIT’s Rack DCLC with STULZ’ world-renowned mission critical air cooling products to create a single enclosed solution for managing high-density compute requirements, will be on display. This 100% contained solution features integrated critical power, rack security and Direct Liquid Cooling connections. Making its debut at ISC18 is CoolIT’s newest and highest capacity Coolant Distribution Unit, Rack DCLC CHx750. This row-based, liquid-to-liquid CDU manages a network of IT cabinets and can support a 750kW heat load with ASHRAE W4 warm water cooling. Additionally, CoolIT’s liquid-to-liquid CDU showcase will include the 4U Rack DCLC CHx80 that provides 80-100kW cooling capacity with N+1 redundancy to manage the most challenging, high density HPC racks. Rack DCLC AHx10, CoolIT’s new liquid-to-air CDU that delivers the benefits of rack level liquid cooling without the requirement for facility water. The standard 5U system manages 7kW at 25°C ambient air temperature and is expandable to 6U or 7U configurations (via the available expansion kit) to scale capacity up to 10kW of heat load. Rack DCLC AHx2, CoolIT’s new liquid-to-air heat exchanger tool for OEMs and System Integrators for DCLC enabled servers to be thermally tested during the factory burn-in process, without liquid cooling infrastructure. CoolIT will demonstrate its advanced Rack DCLC Command2 Control System for CDUs. Attendees can experience the plug-and-play functionality of Command2, including built-in autonomous controls and sophisticated safety features. CoolIT has been selected to host a Birds-of-a-Feather session as part of the official ISC18 conference program on Monday 25 June at 1:00pm. CoolIT encourages all attendees to join the "Planning to Liquid Cool Your Next HPC Deployment" presentation in the Pikkolo Room at Messe Frankfurt. Patrick McGinn, VP Product Marketing & Business Development at CoolIT Systems, will chair the session which will include industry panelists from Dell EMC, Intel, Cooltera and Boston GmbH. To view CoolIT’s products or learn more about Direct Liquid Cooling technology, visit technical staff at ISC18 booth F-940. CoolIT Systems, Inc. is the world leader in energy efficient Direct Contact Liquid Cooling for the Data Center, Server and Desktop markets. CoolIT's Rack DCLC™ platform is a modular, rack-based, advanced cooling solution that allows for dramatic increases in rack densities, component performance, and power efficiencies. The technology can be deployed with any server and in any rack making it a truly flexible solution. For more information about CoolIT Systems and its technology, email or visit coolitsystems.com. ISC High Performance, formerly known as ISC (the International Supercomputing Conference), is the world’s oldest and Europe’s foremost HPC conference. Its history dates back over 30 years, when in 1986 the late Hans Werner Meuer, in his capacity as the director of the Mannheim Computing Center and professor for computer science, organized the world’s first “Supercomputer Seminar” at Mannheim University. In its inaugural year, it drew 81 attendees, mostly German-speaking. Today it is valued by over 3,300 international attendees as a “must attend” HPC event.